You photographed all 20 Heritage units??? Three words for you: HAPPY HAPPY HAPPY. Not sure if you're an Idiot Railfan? Read this. You have found the home of the Idiot Railfan. The purpose of this website is to try to put a little more personality into the hobby (and I know that there are some railfans out there that need a good spike of personality!). There's no doubt that trains retain those bold, powerful, and colorful characteristics which attract us to them; the photo galleries that are provided here exemplify that. I just want to poke fun at the people that go ga-ga over them (me, included)! Below is a list of feature photo essays that I have put together from my own collection or from other guest idiot railfans. With the addition of about a zillion megs of webspace added to the site, I will be randomly adding photos here-and-there (particularly into the archives), so be sure to visit the site frequently!!! After several career and/or residency changes, I have landed in the town made famous by Glen Miller - namely, Chattanooga, TN (and, yes, I have seen the "Chattanooga Choo Choo"). Its a good distance from my previous stomping grounds of Pennsylvania, Connecticut, and New Jersey, but it offers a very diverse portfolio of operations - from Class I's to shortlines to historical museums and operations. 06/02/13 - I have decided to do a little bit of house cleaning, and to add a couple more links to recent photo galleries. My ongoing hunt for Norfolk Southern's heritage locomotives is documented in the Heritage Scorecard gallery. Also posted is my photo summary of my 2013 trip up to Chicago, with several stops in Indiana and eastern Illinois. Enough BS, to the pictures! Numerous photos that I took during the Streamliners at Spencer event in 2014 in North Carolina. Images taken from the TVRM/NS 21st Century Steam excursion from Chattanooga to Harriman, TN and return. A visit to the NC Transportation Museum in Spencer, NC on July 4, 2012 yielded a plethora of photographic opportunities! Since "Heritage Woodstock" at Spencer last July, I have been on an ongoing quest (like most other 'fans out there) to capture all of the Heritage units in service. Various photos of TVRM's equipment and excursions from the past several years. 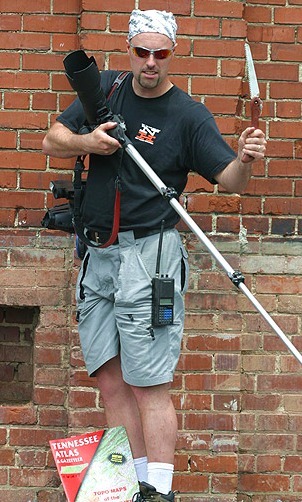 These photos were taken during railroad photographer's weekend events in both 2004 and 2009. Plenty of Alco action!!! My own backyard of Chattanooga became quite the place to 'fan on Sunday, March 9, with a heavy amount of traffic; a variety of motive power and rolling stock; and a lot of friends to share the experience with! For CTC Board's ADINA project, I decided to capture a typical day in North America by photographing in the North Georgia area, particularly between Atlanta and Dalton. Perspectives of the CNO&TP UPDATED GALLERY! A collection of photos taken along NS's CS main (aka "The Rathole") between Chattanooga TN, and Cincinnati, OH - all images cover the second and third districts, south of Kings Mountain, KY. I have some photos posted of the 2004 Austell Railfan get-together. This was an opportunity for close friends from around the region to get together, do some railfanning and exploring, and sit back and drink beer and eat bad food at "FC TOWER". During the first week of July, I took a trip back to my home state to meet up with some old friends, to check out the traffic on NS's Pittsburgh main between Tyrone and Cresson, and to hunt down action on The Nittany & Bald Eagle, The Bessemer & Lake Erie, and various operations of The Buffalo & Pittsburgh. Kicking off the trip was a visit to the O. Winston Link museum in Roanoke, VA. The Tennessee Valley Railway Museum ran several excursions on the L&N's former "Hook & Eye" line out of Etowah TN during the month of May. While the trains never did make it to the famous loop, they still traversed plenty of spectacular scenery. Motive power included TVRM's newly restored NC&StL GP7 #710. During the last weekend in April, A couple of friends and I decide to go camping at a scenic location along the Tennessee River, where CSX's "J" line from Chattanooga to Nashville passes by. NS has trackage rights over this line, which adds to the variety of traffic. During the first two weekends of October 2002, I had volunteered my house and dog sitting services to my brother and sister-in-law, whom live near the Woodstock area. Since the dogs were able to fend for themselves during "business hours", I made it my business to check out the rail activity in that part of the metro Atlanta area. In March of 2002, I took on the challenge of railfanning a new territory: California. For ten days, three of my friends took me on an excellent photographical adventure across the interior of the state. I had lived in the state of Connecticut between March '97 and April '98, and during all of my railfan expeditions there I had found an incredible amount of New Haven Railroad equipment on display and in everyday operation. Heck, there's even equipment that was never effected by the railroad which wears the McGinnis scheme today! These are shots that I have taken around the GE plant over the past eighteen years. Pictures include East Erie Commercial Railroad operations, locomotive demonstrators and other kitbashings, new locomotives, and lash-ups out on the multi-gauged, electrified test track. Some photos I have taken over the past year in downtown Dalton, GA, as well as some of the outlying areas. The Alco/Lackawanna Anniversary excursion weekend in August of 2001. Photos from the Spring 2003 Folkston, GA Railwatch. Yes, I do take pictures of other topics besides trains. This link now takes you to my professional website. My Big Boy is bigger than your Challenger. Entire contents of this website are Copyright Mark S. Wurst Photography, unless otherwise noted. Photos, images, and graphics viewed within the "Idiot Railfan!" and "MSWPHOTO" websites are for personal use only, and are not to be redistributed or reproduced electronically or in printed format without the written consent of Mark S. Wurst. Dammit.